The Druids MCC Rally takes place over the weekend of 27th-29th July 2012 and features a top class line up with live bands, disco, bike show, tatoo show, food and more. 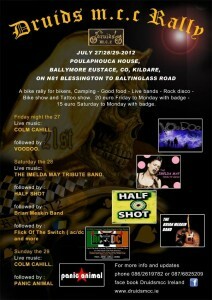 The venue is Poulaphoucha House in Ballymore Euastce, Co. Kildare which is on the N81 Blessington to Baltinglass road. You’ll find full details on the Druids MCC web site at www.druidsmcc.ie or do a facebook search for Druids MCC Ireland.